Hi friends far and near: I have been pretty naughty in the quilt fabric acquisition department lately. But really, who could resist these lovely plaids at the quilt shop, less than $1.00 per fat quarter! I snatched them up! I foresee some more plaid quilts in my future. And at long last, my books came from Amazon. Above are two Evelyn Sloppy books and another string piecing book too. This is a wonderful look-forward-to thing...when I am going to sleep at night, I will browse these books and really enjoy them. The plaid quilt is in one of these books!!! I have been working a lot, lot lately, thus my lack of posts. But progress is still being made! Above is the plaid quilt, with the next border, a narrow piano key one. Boy, this was a lot of sewing! I was going to make the border very wide, but it kind of overwhelmed the quilt, so I cut it down to 3 1/2 inches, like the nine patch blocks, and it looks much better. I have learned a lot about proportion and size in this quilt, and that is good for me. Lots of plaids, huh? Leftover nine-patches in the corners. Amazingly, I just got the book that this quilt was made from! When I am almost finished, that is about how I roll, reading the needed instructions last!! LOL! But, I wanted to honor the designer of this quilt, Evelyn Sloppy, so that is why I purchased her book. She has so many great quilts in her book! Wow, her quilts are just up my alley, so fun. Remember Carrie, the very sick little 19 year old I told you about last post? Well, she is still in our unit, and now septic with candida and bacterial infections. It is very guarded if she will survive or not. She is still on the ventilator...a month of this support now. Her favorite color is green, and I just felt compelled to make her a little green quilt for her lap and legs. I just need to do the binding, hand stitch it down. Her family is faithful and there 24 hours each day...they are so tired. Prayers are still needed for this poor baby girl. I have been trying to catch up on some things...and I know you will recognize the blocks above. These blocks are a free design by http://www.gailpandesigns.typepad.com/. 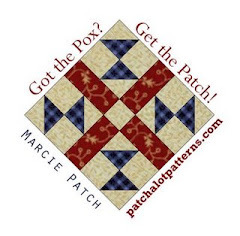 Gail has been most gracious to design and post these patterns for the quilting and embroidery folks out there, at no charge...thank you so much, Gail, I am really enjoying these. So all of you...have a wonderful day, and I hope you can find some joyous quilting time in your busy-ness of the day! Hi friends! Above is ...Tada! the plaid quilt top put together! I still have to add three borders, but the middle is at last a middle. I had a giggle about some of the fabrics, especially the hot, hot pink plaid with the gold thread shot through it? I can just imagine a proud highland warrior, as we see of the covers of lots of books these days, sword in hand, bare chested, muscles bulging, preparing to to battle...in hot pink plaid with gold threads!! Hee!! No subtle red/blue/green/brown plaid for our warrior...hot pink are his colors! Maybe these plaids are not true to the old colors and patterns of the true highlanders, what do you think? Lyn at http://www.bluebirdquilts-lyn.blogspot.com/ and I have had a thimble exchange. I have already received mine, isn't it pretty? Thank you Lyn! Yours is on the way! Nancy of http://www.wyomingbreezes.blogspot.com/ made this amazing hand braided and woven rug. She used denim for the warp? I think that is what it is called, and loads of colorful fabric for the weaving. It is so heavy and lovely. I love it!! It so reminds me of my mother and her braided and rag rugs. My great friend Karen of http://www.leehaven.blogspot.com/ made the above bowl. Cool! It is so gorgeous is person, saturated with color and love and has it's own jewel to cap it all off. Gorgeous! Thank you, Karen! I truly treasure this. This is when I had all the rows done, before I picked them up to sweep and mop. I am so glad the middle is a middle! We have the youngest and the sickest of the Weggener's patient still in our unit, just fighting for her life. She is 19 years old, and I call her the princess. She is tiny, and has a massive head of curly blond locks. Just a doll, and just married one month! Her young husband is doing a valiant job of staying right with her and loving her. She is a black belt in karate, by the way, so maybe she is a warrier princess. Her mom is a nurse too, and they are just a fine family. The family said I could mention her in my blog, and gave me permission to tell you all her name: Carrie. She is still on the vent, paralyzed and sedated with medicines, still on dialysis every day, liver problems now...and I pray to the good lord her neuro status will be OK when she is off all the sedation. She is on chemo, and it is terrible for her reproduction system, and they want lots of kids. Hope everything will still work perfectly for that part of it. Would you each keep her in your prayers and thoughts this week? She really needs it so much. I will keep you informed of her progress. Have a super day! It was my birthday yesterday, my son called, we went out to eat, and just had a quiet day. Fun!! Saturday, and I am at home! Hi friends! Unexpectedly, I am off today! I worked Friday, and work Sunday, but they said I could have off today from the hospital, due to a low census day. Yippee!! Are you about getting tired of seeing the plaid quilt above? Just an update anyway...all the blocks are done, and I am in the process of putting them together. I have the four rows above together. Brighter than I thought it would be! Nurses use a lot of medicines with flip top lids. Each brand/maker puts a different color on their particular drug. I have saved a few...actually I have a ton! Why? What in the world can I do with these little pieces of color? Any suggestion is worthy...and would be so appreciated. I was lucky this week! I won a giveaway from the Texan! Very nice lady, and very nice blog. She is cleaning out her sewing goodies a little bit and I received some of her books. Thank you Texan!! We have three cases of a pretty rare disease happening in our unit. Out of 20 beds, it is kind of strange to me. The disease is Wegener's granulomatosis. An odd disease for a cardiac intensive care unit. Strange that a 19 year old girl, a 45 year old lady and a 72 year old man each presented with different symptoms and came out with the same diagnosis. Sadly, the prognosis is very bad for the two younger ones, but the older gentleman is making great progress. I am remembering all three in my heart, here at home today. Do you know that pesky Joann? Seriously, isn't it pretty? And not expensive at all, I didn't think. A scarf for my precious new DIL in the works. That Joann...really is a pretty nice lady! By the way, I forgot the fabric I was after in the first place. HI friends: Today, I was off from work. I made the little bag above, and the pattern is at the Moda bakeshop site. It was fun and fast. I have no clue what I am going to do with it, but it was fun! I also made some more 6.5 inch plaid string squares. Just have a few more of these to you and the string top will be ready to put together. I was lucky enough to get to go out for lunch with DH, he is so very busy lately, so it was a treat! Hope everyone had a Marvelous Monday! And have a Terrific Tuesday tomorrow. Close up of some of the Plaid quilt blocks. Really, it just needs pressing, it is not as wonky as it looks!! All the nine patches and corner stones are made, and now I am just working on plaid sting blocks. Each block takes about seven minutes to make...pretty fast, huh? I received the most wonderful birthday present! 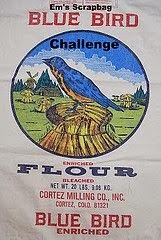 This is from Lyn at http://www.bluebirdquilts-lyn.blogspot.com/. I was so excited to see a package on the front step yesterday!! Then all these lovely gifts. I sure am spoiled, don't you agree?? Lookeee! What a gorgeous quilt! Thank you Lyn, so much! I just love it! OK, I don't know how to turn the picture...but please take a look at this lovely doll stand and doll dress. So very cute, and impeccably made. And a wonderful antique drawer (Lyn, my scissors go in here), and a wonderful Chatelaine too. A needle case, thimble holder, scissors holder and pin cushion. It is just beautiful! Thank you so much, dear Lyn!! And below is the post I started to write with no pictures...sorry so long today! Guess I am a long winded old gal. 1. The strips, since these are small blocks, need to be fairly narrow, to better match the gauge of the cornerstone nine patches. I tried bigger strips, and the blocks just do not look as good. 2. Smaller strips of the plaids focuses the attention on the color, rather than the pattern of the plaid, and don't stretch as much. 3. A few of my plaids are not really plaids, but just plaid printed fabric. I like the woven plaids, because they are reversible. 3. I looked up Highland Tartans, to see if any of the fabrics I was working with were authentic Scottish patterns. I learned that the fabric back in the old-time Scottish days was all wool, not cotton as I am using, and that each clan had their own pattern. There are several wonderful websites with information about authentic plaids if you just look up Scottish Tartan. Does your family have a plaid pattern? Would love to hear from Scots who actually have a pattern! I know many of you know more about real plaids than this...care to share your expertise? I would love to know more. Re-using these old shirt and given-to-me fabrics, recycling. I am so happy that Terry, of www.terrytreasures.blogspot.com wanted the magazine for Bonnie's new mystery quilt. Just send me your snail mail address, and the magazine will be on it's way to you, Terry! Have a great day to everyone...remember to tell me if you collect heart rocks!! Do you recognize the above set-up? It is Bonnie of Quiltville's new mystery quilt! She has published it in Quiltmaker, and it will be in three parts. I have selected my fabrics and sewed my 4 patches...so I am making progress! Have you been wanting to get into the mystery? I happen to have two of these Quiltmaker magazines! I ordered one, and it never came, so I bought one, and of course the next day, the magazine came. So I have two. I would like to give one away to someone who has been wanting to participate in this mystery. Be thoughtful...have you been wanting to do this one? You will need to get the other two magazines for the other two parts of the mystery when the magazines come out...but this could give you a start!! If you want it...please tell me and I will send it to you. Be sure it is something you will use and not take away from the chance for someone else...but if this is you, it is yours! First come, first serve. This is to honor Darcie of October's Child custom quilting. She collects heart rocks, and so do I! so I wanted to show you mine. Do you collect heart rocks too? I would love to see your collection!! Have a wonderful day...tomorrow is a quilting day! Off from work! We have the most precious old gentleman in our unit. He used to be a banker, and is quite sharp, except for the Alzheimer's moments creeping in now and then. There has not been a moment when I zipped past his room that he is not smiling ear to ear, and always has a pleasant comment for everyone. The comment may be a confused one that does not make sense! but the kind, sweet intent is there...he just makes me happy to see him. Hi everyone!! Please let me introduce Abby Sue!! Abby is my DDIL and DS's dog...isn't she a cutie? A little blurry, and you can just see the leg of their big dog, Bella. As you can see, Bella towers over Abby, and they are the best of friends. They are both so much fun, and guess what...they were here for a visit this weekend! They brought our DS and DIL too, and we had a marvelous time! Eating and visiting and giggling and riding bikes and hula-hooping and (don't ask...or do)! What a fun weekend! (Have you ever hula-hooped?) Great fun!! Today, after the kids had gone and the house was still relatively clean, I worked on the plaid quilt. I figured I would do the cornerstone nine-patches and the sashing first, so then all the leftover strips would be used in the string blocks. The nine-patches finish at 3 inches, and the sashing is 6 inches. Some of the strings left over...I think I will have to cut more. I am loving all these different colors! Who knew I had all these different plaids lurking in the back of the closet, just waiting for their chance to spring onto the scene and make their mark! Hope you had a super great weekend too, to each one of you. Back to work tomorrow for me!! Do you have a system or way that you keep your home clean? I would really value and treasure your input! !